KAR Construction is proud to offer one of the latest trend setting tools in the Concrete Industry � The Plasteek Groover� This revolutionary tool can be used to groove wet concrete right after the Bull float or Fresno. Simply snap a line, pick a sight point and use the optional guide pin on the Plasteek Groover� . Long straight grooves are easily made in wet concrete, without leaving unwanted marks! 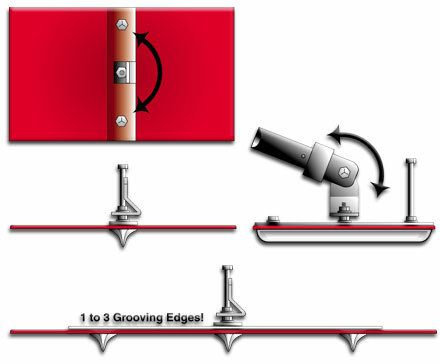 Multiple groove heads are available for making perfectly parallel lines. The tool is rugged, lightweight, and fully adjustable for a variety of needs. Whether you use it for expansion joints or decorative finishing, you will find the Plasteek Groover� saves time, as well as your knees! Prices start at $120.00, shipping not included. KAR 810 Single Bit Ridge 2 lbs. KAR 811 Single Bit 2 lbs. KAR 850 Single Bit V Shape 2 lbs. KAR 820 Double Bit 5 lbs. KAR 830 Triple Bit 5 lbs.